Council could move forward with the purchase of the truck now or ask voters for their opinion in November before deciding. Palmyra Borough Council has a decision to make — start the process of purchasing a new ladder truck for the Palmyra Fire Department or wait to gain input from voters directly with a non-binding ballot referendum in November. How council will resolve the issue was unknown this week, even after a special Borough Council meeting at the firehouse on Broad Street that followed a four-hour open house where the fire department invited members of the public to tour the facility. During the open house and meeting, Fire Chief Richard Dreby once again made his case to the public on replacing the department’s aging 100-foot ladder. According to Dreby, the department’s only ladder reached 25 years of service this year — five years past the 20-year timeline when the department has typically replaced its ladders per department policy and the recommendation of insurance underwriters. Dreby said in recent years, it has become more difficult for the department to find replacement parts for the ladder, which was custom built to fit the station’s door openings of 10 feet, 2 inches due to station’s prior use as an A&P Market. In the last three years alone, Dreby said the ladder has required $22,000 in repairs, including when the truck was out of service due to problems with its hydraulic cylinders where the service company had to search for two weeks before finding a company that could rebuild the cylinders. For replacing the truck, Dreby and the department have suggested a 100-foot ladder from Pierce Manufacturing in Wisconsin, which quoted the department a price of $1,003,000. Dreby said the price from Pierce was below quotes of $1.4 million and $1.35 million from other manufacturers. Dreby also noted the department’s other two engines are from Pierce, and the department has confidence in the manufacturer. “What we’re trying to do is stay in the system with the manufacturer that we’re used to dealing with and the people we have faith in to build the truck…cheapest is not always the best, but in this case we have experience with the manufacturer, ” Dreby said. 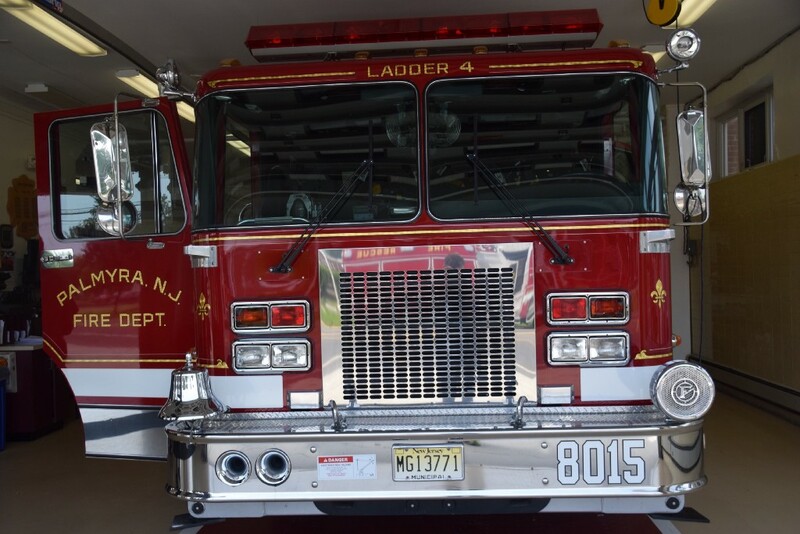 In speaking to the need for another 100-foot ladder, Dreby said his firefighters need to be able to safely reach the township’s highest commercial buildings and two-to-three-story dwellings that often sit back off the road. Dreby said the ladder truck would provide more safety in delivering streams and protecting exposures. If council were to move forward with purchasing the new ladder, officials say the purchase would be done through a 15-year bond and would cost the average Palmyra home owner $27.66 per year over the 15-year life of the bond, or $414.90 in total. Should council choose to skip a referendum vote and directly approve the purchase, Dreby said he would hope to have the truck ordered by September, with an expected delivery 13 months later. Outside of $50,000 already in the operating budget for the bond, Dreby said the borough would not be responsible for making any payments until the department takes control of the truck after delivery. Dreby also noted that if the borough waits for a referendum during the general election on Nov. 7, the cost of the truck would actually rise another $30,000 due a manufacture increase the department cannot control. Officials also noted any referendum in November would be non-binding, meaning members of council would still be tasked with deciding whether to purchase the new ladder regardless of how the public votes. Members of the governing body at the meeting this week included council members Frank Cosky, Lewis Yetter and Gina Tait, along with Mayor Michelle Arnold. Cosky, Yetter and Arnold all spoke in favor of having council approve the purchase of the truck without a referendum, while Tait said she was unsure of what council would do. Not present were council members Timothy Howard, Bernadette Russell and Mindie Weiner. Arnold said council could decide whether to hold the referendum at its next meeting on Monday, July 17.